Looking for infant sunblock can be quite controversial in that a child under 6 months really shouldn't have it's skin exposed to the sun directly. In general, all individuals or organisations, whether qualified doctors, pediatricians, dermatologists, cancer research companies, sunscreen manufacturers, or Government official bodies, will say that no child under 6 months of age should be exposed to the sun either directly or indirectly. However, they do also all say that if there is no choice available, then there are some infant sunblock options to consider as the best choice for the child's protection. My daughter is three months old and as we spend a lot of time outdoors I would like to know what type of sunblock I can use on her? Is there any infant sunblock suitable for babies younger than six months? Most sunscreens or sunblocks say not for younger than 6 months on their labels so I am not sure what to use? We keep our 4 month old baby under an umbrella or in the shade when we are outdoors, but her cheeks still seem to get a little rosy. Is there a sunblock for infants to recommend? The doctor said we must keep our baby of 5 months out of the sun altogether between 10am and 4pm but we are just not able to do this every day. Can you recommend a sunblock for babies under 6 months? There are actually many sunblocks on the market that claim to be for 'babies' or infants' but in reality are compelled to put 'not for use on children under the age of 6 months' on their labels. Various experts now agree that, for babies under six months old, it's okay to put sunblock on ONLY if in small amounts on small areas of the child's body, as the benefits will outweigh the risks. "Infants and children have what is called a high body surface to volume ratio. What this means is that proportionately babies have more skin for the size of body as compared to an adult. 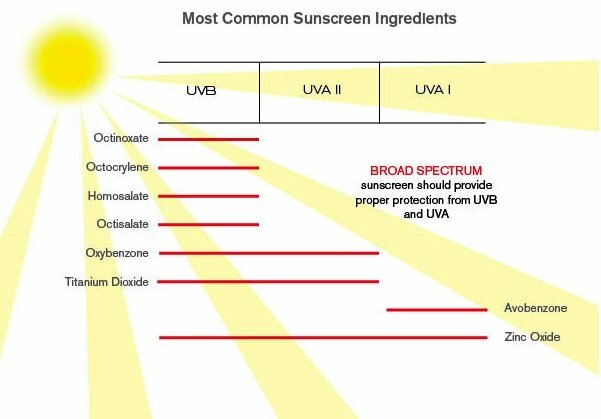 Sunscreens are made of chemicals. On the older child or adult, the chemical exposure is relatively minimal because the body surface ratio is smaller than a baby. Therefore, babies get a higher 'dose' of sunscreen than do those that are older. While this exposure would most likely not cause any problems, the likelihood of an adverse reaction is much greater." Also, babies do not necessarily have a more sensitive skin. Instead, they have a thinner skin. This means that they absorb more of the chemicals in the sunscreen and because their organs aren't capable of processing the same amount of chemicals as an adult. This means it can be a whole lot more damaging to them. Most people don't realize how much we absorb of everything that we put on our skin. So the big message here is not to cover your child from head to toe with an infant sunblock, but to supplement where required on small parts of exposed skin. New research from the skin cancer foundation is proving that it isn't necessarily the amount of time a person spends outside that increases their risk of skin cancer but instead it's the age that they started being in the sun. The younger the age the higher the risk of skin cancer. It's better to keep your baby out of the sun altogether if you can. But when that's not possible, I recommend choosing a "physical" or "chemical-free" infant sunblock made with zinc oxide ONLY and free from any toxic chemical ingredients. Unlike chemical sunscreens, which may cause irritation or allergic reactions because the skin absorbs the active ingredients, zinc oxide sits on top of the skin, forming a barrier against the sun's rays. Another important factor is that sunscreens with zinc oxide start protecting as soon as you put them on. Estrogenic effects were noted in laboratory animals at concentrations close to those experienced by sunscreen users and were also shown in test tube experiments. This typically undergoes some degradation when exposed to sunlight and although the safety record seems to be fairly good, it has been linked to contact dermititus. A carcinogen containing dioxane, which is one of the most potent toxins known to man. According to a warning by the FDA of 2008 "Phenoxyethanol is a preservative that is primarily used in cosmetics and medications. It also can depress the central nervous system and may cause vomiting and diarrhea, which can lead to dehydration in infants". This is a carcinogen containing dioxane, which is one of the most potent toxins known to man. Also causes genetic mutation when exposed to sunlight. Robert W. Steele, MD, is a board certified pediatrician at St. John's Regional Health Center in Springfield, MO.